Ubisoft Acquires Brawlhalla Developer Blue Mammoth Games | Nerd Much? Ubisoft has announced today that they have acquired Blue Mammoth Games, the developers behind Brawlhalla. The latter is a platform fighter that is free-to-play on PC and PS4. Each match can take up to 8 players online and locally. Brawlhalla has various modes to fit all types of players, including free-for-all, ranked matches, and custom matches. Blue Mammoth even introduced a world championship event in 2016 for Brawlhalla with a $50,000 prize for winners. In 2017, Blue Mammoth held another worldwide competition, Brawlhalla Circuit, with a prize pool of $100,000. Needless to say, Brawlhalla was quite successful in its own right, even if the numbers do not hit eSport levels. They have already kicked off their third year of world championships for the game in partnership with Dreamhack. In the coming months, Woomer and Hamilton state that they look forward to Ubisoft leveraging its expertise and resources in order to provide long-term support and development for Brawhalla. Most especially in bringing in new players to the game and competitions. As such, we can look forward to more Brawlhalla updates and bigger, better, competitions. 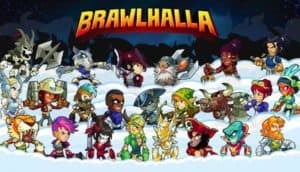 It is good to see smaller studios get big opportunities and support like this from huge publishers, especially for an exciting game like Brawlhalla. The game is both stylish and easy to play, even for beginners playing a platform fighter for the first time.